This song meshed the much loved Ariana Grande vocals with a calm and mellow pop beat. Its catchy beat took hearts all over the world. It also encouraged women and men alike to love themselves and to appreciate what life and their past relationships have taught them. Women all over the world now look up to Ariana Grande for her fierce passion to still continue her music, while also dwelling on her strong nature to continue even when other would’ve ended after all that she went through. Ariana Grande also recognizes the new relationship that she is in, with herself. “Spend more time with my friends, I aint worried ‘bout nothin’, / Plus I met someone else, We havin’ better discussions, / I know that they say I move on to fast, but this one gon’ last, / ‘Cause her name is Ari, And I’m so good with that (so good with that).” She acknowledges that this one is important to her. She also recognizes that this one will last and that she knows how important it is to know and have love for herself. Some girls and women around the world recognized this as encouragement to simply love yourself first. Toward the end of the song, singer, Ariana Grande, tells her fans and audience what loving herself had taught her. She states, “She taught me love (love), She taught me patience (patience), How she handles pain (pain), / That amazing (yeah, she’s amazing), I’ve loved and I’ve lost (yeah, yeah), / But that’s not what I see(yeah,yeah), Ain’t no need for searching”. Before the song ends, Ariana Grande states her optimism for marriage in the future. 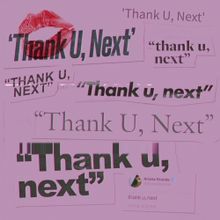 This showed fans around the world that in the future she looked forward to possibly thanking here dad, “‘Cause she grew from the drama.” This song was an impressive addition to Ariana Grande’s already abundant amount of hits. How are you spending St. Valentine's Day? Having a special date with a box of chocolate. Sending myself flowers so that I feel loved. Watching Romantic-Comedies that make me feel sad. Giggling at the Valentine's Horoscope. Despising this awful holiday for eternity.